Hawaii Native Status: Cultivated, but it can appear to be growing wild. 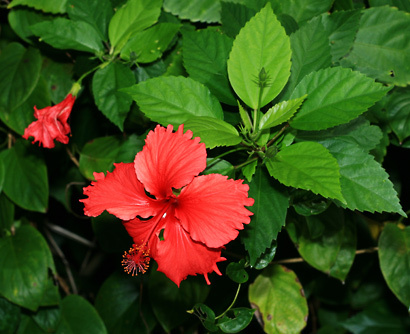 This ornamental garden plant is native to tropical Asia. Description: The flowers are 4 to 8 inches (10 to 20 cm) wide and have a whorl of 5 egg-shaped, toothed or smooth-edged petals that are fused at the base to the central column. The central staminal column is tipped with a 5-lobed style above multiple yellow anthers near the tip of the column. The wild-type plants have single, red flowers, but the cultivated varieties can have single or double flowers in a wide variety of colors. The flowers attract nectar-loving birds like Japanese White-eyes (Zosterops japonicus). The leaves have pinnate veins and are green, coarsely toothed, alternate, and oval-shaped with a pointed tip. The flowers only last one day, but since they do not need to be placed in water, they are a popular choice for wearing in your hair here in Hawaii. 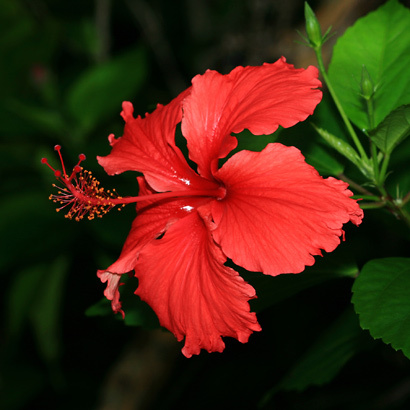 The juice from the flower petals is used in herbal cosmetics. Juice from the darkened, wilted flowers is prepared to make a blue-black dye used in shoe-blacking, eye-liner, and mascara. Butterfly Plant – The flowers attract larger butterflies. Edible – The flowers are edible either raw or cooked. The flowers will not wilt until evening, so they can also be used as a long-lasting food garnish.